One thing that both bikes had in common was the tyres. Both bikes are wearing Mitas E-07's and both Neil and I really like these - in the conditions we were riding in they were...wait for the cliche...confidence inspiring. The only difference is that the Tiger wears a 21 inch on the front to the V-Strom's 19. Also, Neil's tyres were at the end of their life (a very respectable 11,000km) where as my rear only has just under 3,000km and the front about half that. Walking around the Tiger you can see what Neil spends his pocket money on - he has added quite a few nice little farkles to make the bike his. The most noticeable being the crash protection and the Arrows can but there are little things like a "foot" on the side-stand, the fog lights, bigger/wider pegs and the list goes on. There are also a couple of invisible farkles in the form of upgraded springs both front and rear. The bash plate looks the biz and the V-Strom could use one as the plastic cowl on the bottom is really only for looks and there's a nice vulnerable oil-cooler hanging down below the front exhaust header which I'm sure would not appreciate being clobbered by a rock. The Tiger also probably has slightly more ground clearance (and plenty more suspension travel) although even on the 42nd Traverse I don't think I scraped the cowl on the ground. Righto, so we've walked around the Tiger and checked out all the sparkly farkles, time to get on and see how she fits. So the seat is slightly higher than the V-Stroms but I think that it is perhaps a little narrower up close to the tank and I didn't really notice the seat height as a problem. Flicking the side-stand up and lifting the bike to vertical was a piece of cake - to me the Tiger felt even lighter than the stats indicate. Neil had his tank-bag on and it sat up high and forward enough that it didn't get in my way. This also added to the feeling of sitting "in" the bike rather than on - fairly similar to how it feels on the V-Strom. Neil has also adjusted his handle-bars and controls a fair way forward. He has done this so that the bike feels better when riding standing on the pegs - the larger foot-pegs also help here. The position of the controls didn't really affect anything when riding sitting down either although I had to have a couple of goes at finding the indicator switch. The handle-bar position also feels a lot more "aggressive" and I felt that it made me feel more like grabbing the bike by the scruff of the neck and cutting loose - bummer eh? Finally it was time to fire up the beast and get rolling. After finding the key (partially hidden by the tank bag) I thumbed the starter and the little triple snarled into life before settling into a smooth purr. By comparison the V-Strom sort of explodes into life before settling into a typical V-Twin rumble. The triple obviously spins up quicker than the twin and both engines definitely have distinctive personalities. Leaving Hunterville and getting out onto the open road I definitely noticed the lower gearing on the Tiger. Neil has dropped one tooth on the front sprocket and while I have also recently done the same on the V-Strom the smaller Tiger engine is spinning nearly 1,500rpm higher than the Vee at 100km/h. With the Tiger engine being so smooth this isn't really an issue but possibly hurts the fuel economy on long sections of sealed road. Later I was to find that the lower gearing meant that when off the seal there was always a gear for every condition. Turning off the main road and onto Murimotu Road we started to encounter a few more corners so I had the chance to start to get to learn the Tiger's handling characteristics. To me the bike felt very light and chuckable - just like a big dirt bike. I had thought that the 21 inch front might slow the steering down a little (I've noticed this on other bikes) but I had no issues there. The roads were a little damp in places so we didn't push too hard but I had absolutely no complaints about the suspension and brakes - everything just worked and I felt quite at home on the unfamiliar mount. I was also getting used to the engine and found that 4-6,000rpm kept things humming along pretty nicely. The clutch and gearbox action were just a couple of other things that I didn't have to think about. Turning off onto Watershed Road we eventually left the tarmac and got onto some great gravel that was in really nice condition. Things did not slow down a heck of a lot and the Tiger felt really good - it didn't take me long to get used to how it handled in the gravel and I really got into it. The smooth power delivery was really nice as you came out of the corner. You can just roll on the throttle and the power comes in nice and smoothly and it's easy to tell when you get near that point where the rear wheel wants to break traction and if you really want to, you can then back it off a bit - or not. With the combination of the willing motor and lowered gearing the gearbox gets a fair workout which I actually quite enjoyed - I was riding the bike the whole time. By comparison if you are a bit ham-fisted on the V-Strom it does not take much at all to get the rear end to break free - the torque from the twin can be a fair bit more violent if you are not careful. Neil had this happen a few times (and think it probably put a grin on his dial) but soon came to grips with the beast and was napping at my heels. The Vee also doesn't require as many gear changes - it will lug at low revs (generally I try to avoid 1st gear on gravel) and between closer corners it is fun to just hold a gear and then back off and enjoy the engine braking (and music) as you slow up for the next turn. I ended up doing probably close to 100km on the Tiger in gravel and enjoyed every second - except perhaps some mushy stuff where the front end tried to go out from under me a couple of times, the worn front tyre was probably my enemy here. One of the highlights was in the afternoon when we were on fast gravel and having a real ball - both bikes got their legs stretched and we even copped some air over a hump in the road at one stage! This morning I had a call from Neil who was escorting Colin back home from a trip up to Auckland. 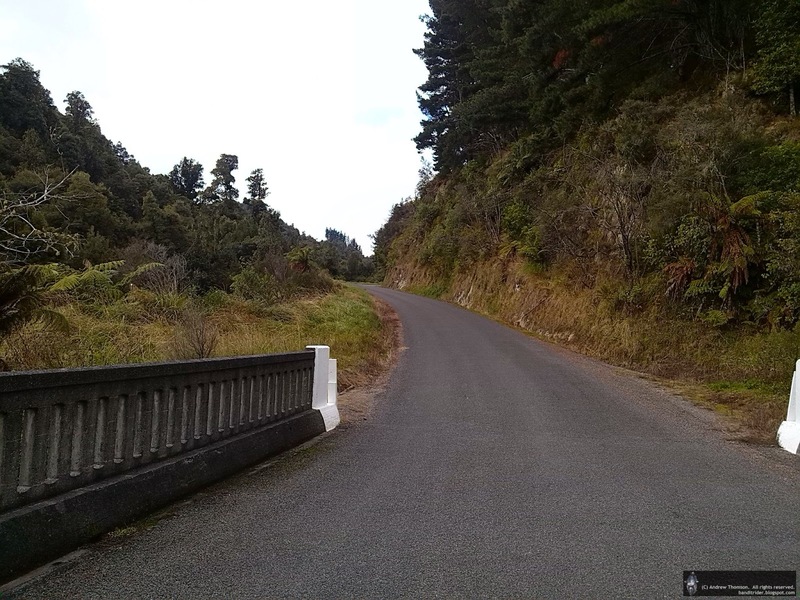 They were coming down the Para's to Wanganui and Neil wondered if I wanted to join him for a squirt up the Wanganui River road which he had heard had been sealed all the way through. 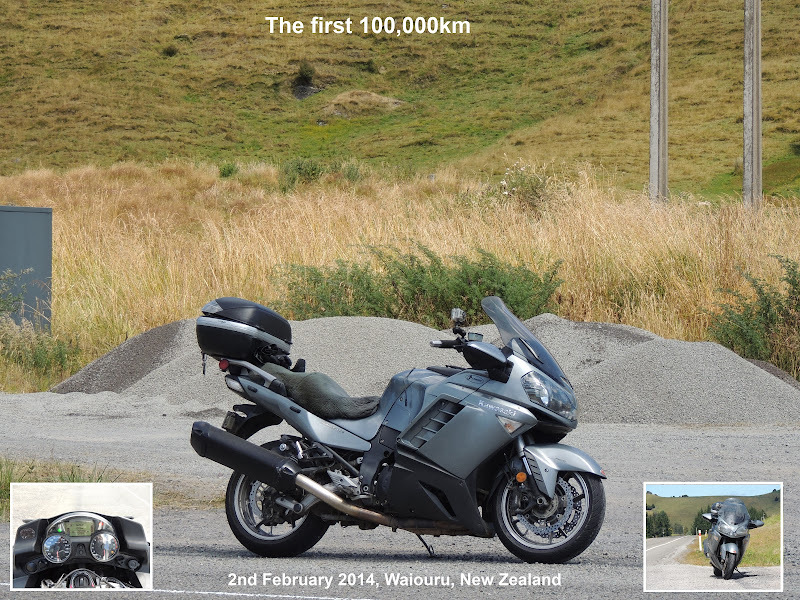 Funnily enough this tweaked my interest as it is a great ride through some fantastic country and last time I had done it was on the DL with the Back Road Riders - this time could be the Connie's first trip through to Raetihi. 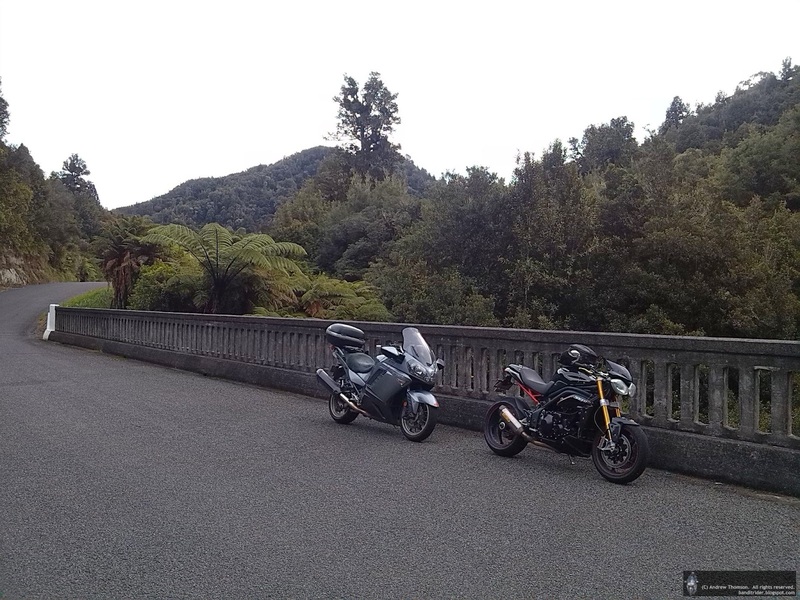 After walking the dog (who was then most disappointed to see the bike being wheeled out of the shed) I saddled up and made my way over to Wanganui. I had left a bit later than planned as I was trying to find the GoPro housing but failing miserably. This meant that I ended up taking the direct route so had to behave myself with plenty of traffic on the road and the fuzz out in force this weekend. In the end I pulled into the gas station at Wanganui just a few minutes ahead of Neil. We gassed up the bikes and then ventured to the cafe across the road for an early lunch before our squirt up the river. On the road and turning of onto the river road we had our first surprise in that there had been a bit of logging done since last time with a lot of the pines being taken out on the first little climb to the below rest area. Before we hit the road again I was forced to swap bikes with Neil so did that and took off with a roar out of the arrows can. From here on the road is pretty narrow and definitely pretty bumpy in places. Adding to the hazards are all sorts of livestock on the road and other vehicles using more than their share of the road. Besides that, the ride is fabulous and the views stunning all the way up the valley. When we hit the recently sealed section we ended up slithering around on all the loose metal that the road workers had left behind. In some corners it was pretty bad with some bigger stones that may have come off the banks. I had a couple of wee moments on the Speedy but managed to keep it upright and was pleased to see that Neil was doing the same thing on the Connie. Back on the Connie for the last of the slippery stuff into Pipiriki and I was probably a bit more at home on the heavier bike. After Pipiriki there are more great corners to tackle but there were also tour buses towing trailers coming the other way which we had to steer clear of a few times - I think they must own the road. There was also still a few more sites worth the odd pic. Just one more little winding uphill and we were then onto more smooth and open riding for the last 10km or so into Raetihi where it was time for another coffee. The poor old Connie has been a bit neglected lately but with a nice day put on today it was time to get her out and give her some exercise. 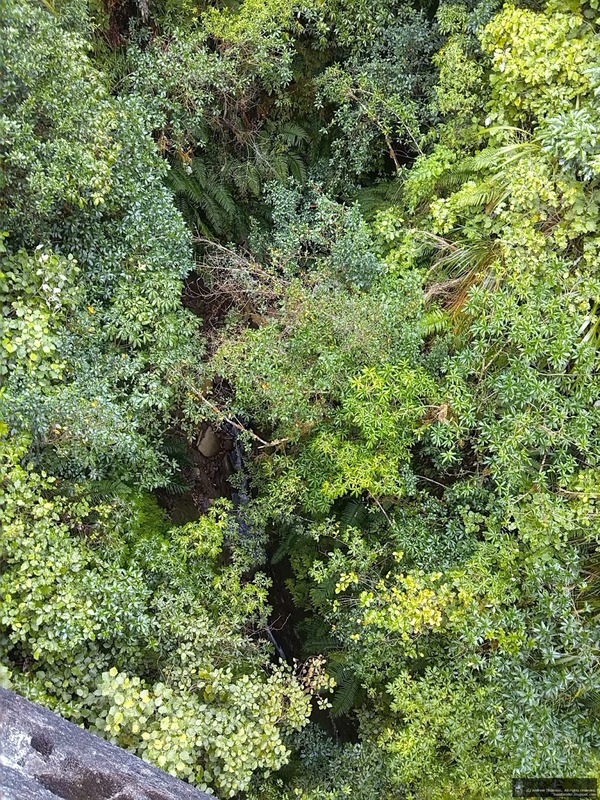 Earlier in the week the tag had been moved from Makuri to Apiti so it looked like a trip around the loop was on the cards. 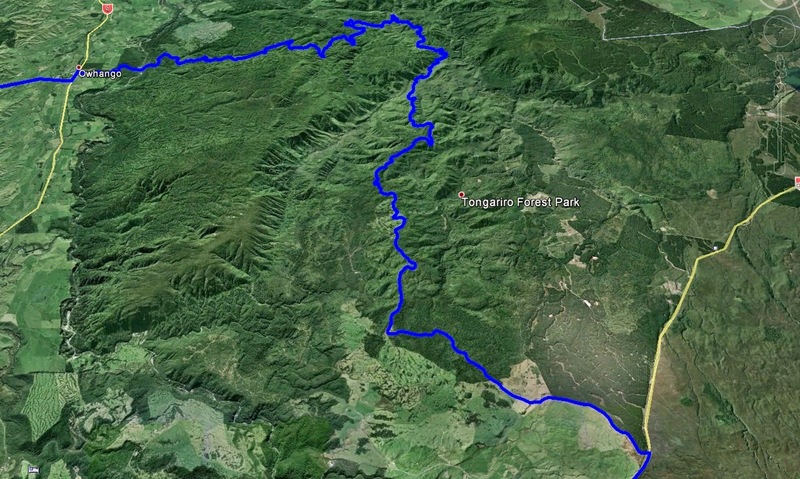 After a quick bite in Ashhurst I was soon onto the familiar Pohangina Valley East Road for the trip around the valley to Apiti. As always it was a great little ride and the autumn colours were very nice. I should have had the GoPro onboard taking snaps - there were some nice views out across the valley too. 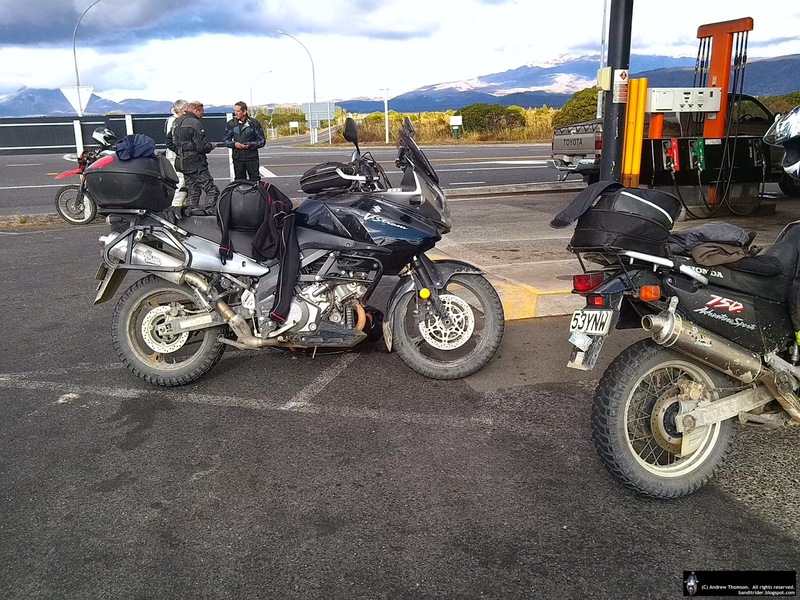 Arriving in Apiti I spotted two familiar bikes but rudely pulled up short of them so I could nab the tag picture. It wasn't a bad spot to park either. Now I'd better be a bit careful in explaining the next bit of the ride so I don't give away the new tag's position. Suffice it to say, getting to the tag involved more great riding on fabulously winding back roads. We arranged to meet in Hunterville at 10 but as usual I was busting to go so left home at around 8:30 for the short hop to Hunterville. We'd had a lot of rain the previous day (and throughout the week) and the roads were still pretty wet as I made my way over to Vinegar Hill. As I was nearing the Stormy Point lookout I noticed that I was still far too early so I pulled in for a quick nosey and some pics. 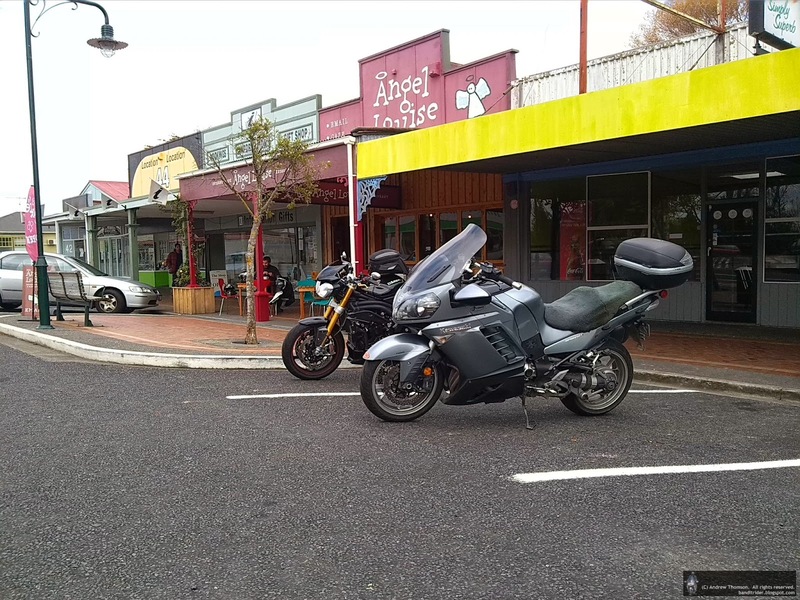 After my quick stop I polished off the rest of Vinegar Hill and then rode onto Hunterville where I fuelled up the horse and then moseyed around town to kill some time. 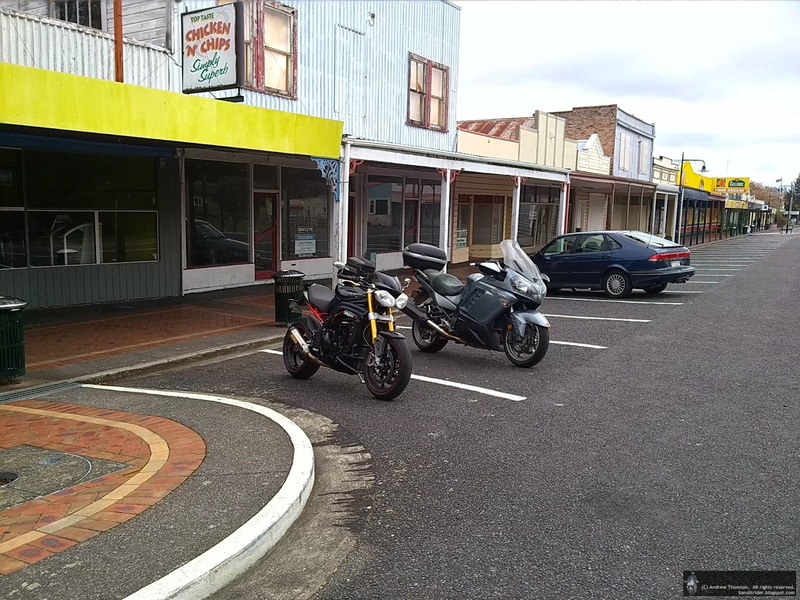 Hunterville is pretty small so the moseying didn't take that long so I parked up at one of the cafes and grabbed a coffee. About ten minutes later the Tiger turned up and Neil bowled on in for some sustenance and some bike chat before our ride. Eventually we decided that we couldn't sit in the cafe all day and that perhaps we should actually go for a ride. Gearing up, we lowered our tyre pressures and explained a few things to each other about our bikes: "That's the front end - keep it pointed ahead of ya and try to stay out of the drains." 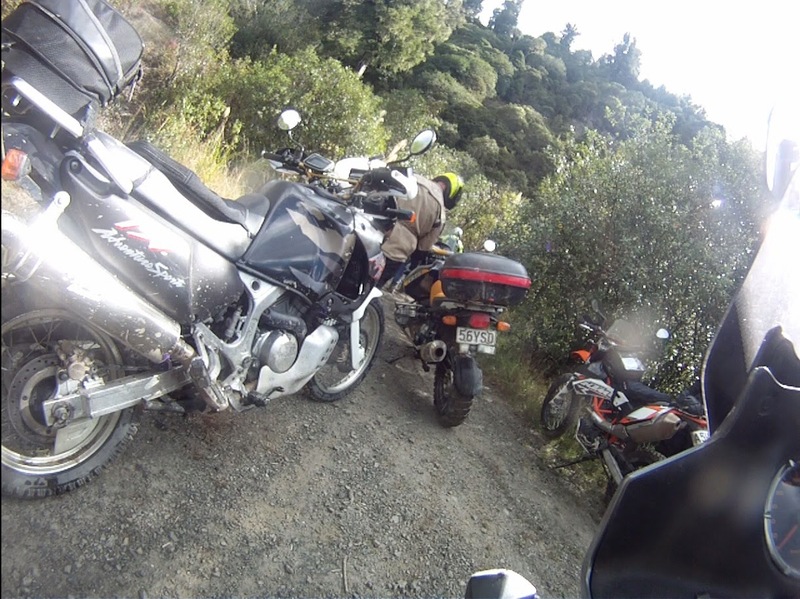 In my GPS I had a route planned to take us via Watershed Road to Taihape, so I led off - on the Tiger, with my GPS still on the Vee...Nevermind, once Neil pointed out the first turn-off I was sweet and we were soon setting to work getting used to each other's bikes. 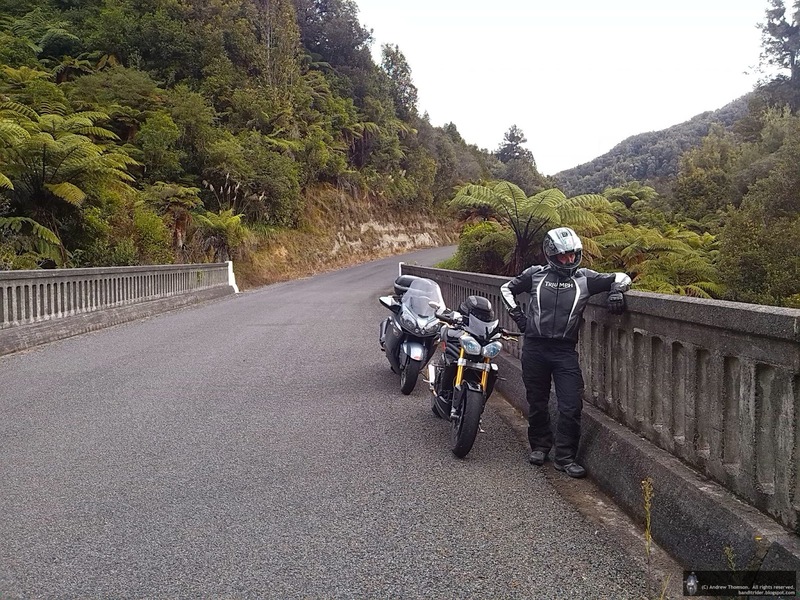 As it turned out this wasn't such a bad idea as we got to ride some of the best gravel roads around twice - once in each direction - as we took in Matawhero, Rangitikei Valley, Mangaohane Roads all the way from Pukeokahu to the Napier-Taihape road and back again. Once again the gravel was in perfect nick and we had a ball. 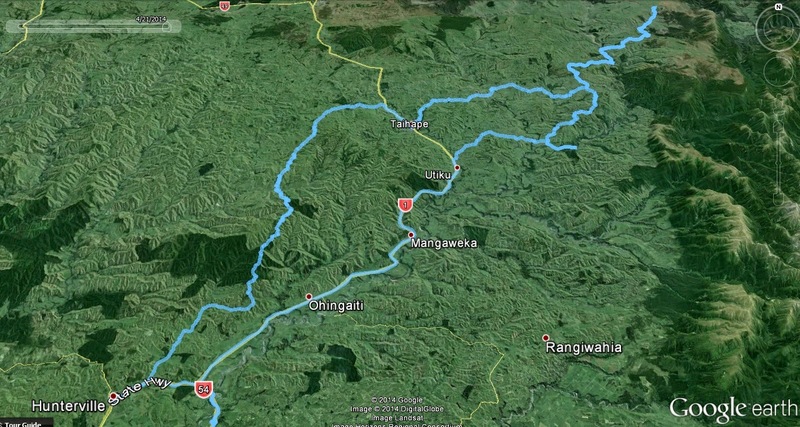 Back in Pukeokahu we then took Pukeokahu Road through to Taoroa Junction. The gravel through here was a bit more demanding. The roads were a bit tighter and conditions a bit softer in places. I had a couple of moments where the front end went out on me and I had to wrestle the bike back into line - Neil, time for a new E-07 man! We carried on up the road a wee bit to Gravity Canyon where it was time for another break to watch people throw themselves off a bridge and to chat about the ride. After our break it was time to swap back onto our own bikes for the ride home. I'd had a ball on the Tiger and now had to relearn the DL as we rode back to the main road. There we parted company and I settled into pootle mode on SH1 before taking in Vinegar Hill again to get me home. One awesome day out on two great bikes! A few more crappy pics here. So, our warm-up and lunch break taken care of, it was now for the main event - the 42nd Traverse. "in a South to North direction mainly due to a rock slope/wall approximately halfway through the track which is easier to go down than up"
The track started out pretty easily with a nice ride through some bush before the track started to climb higher and the track get a bit rougher and more overgrown. The odd bit of brush hitting you is not too much of an issue but in a few places the "brush" was blackberry that had been sprayed but not chopped back off the track - a wide berth was needed. The terrain was mostly dry but as you can see from the videos quite rocky and bumpy - third gear was definitely not going to be needed for sometime. There were also a few sections where the surface was was wet clay with the odd decent puddle so I trod pretty carefully through these. It was fairly hot work manoeuvring the bike over and around some of the obstacles so it was nice to stop in the shade for a quick spell and a drink. After this brief pause it was on up the hill and into terrain that was gradually getting a bit tougher. 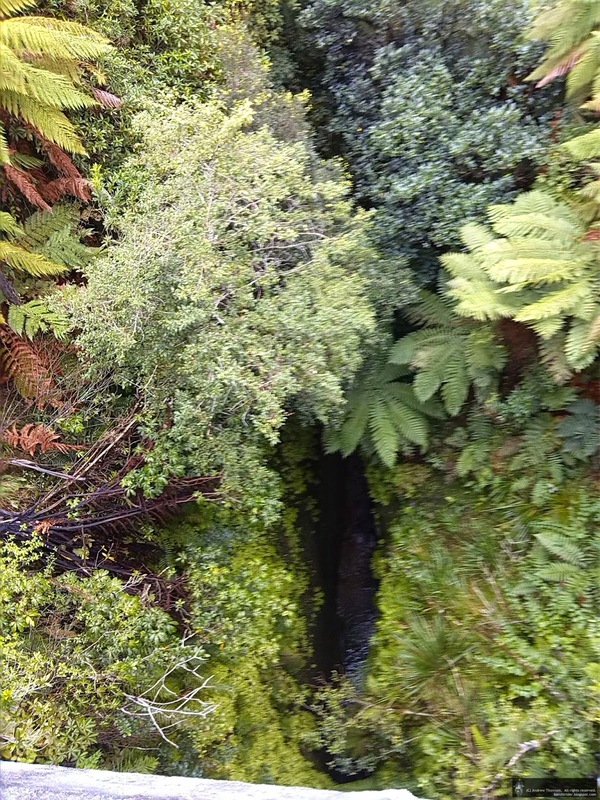 As you can see from the end of the next video the first water crossing got the better of me and the poor bike decided to take a nap after trying to take on the undergrowth. What actually happened was the rear tyre slipped off a rock (just as I was coming out of the creek) and pointed me into the bush and in the end I just couldn't hold up 200+kg of V-Strom. Luckily there was help quick to hand and we soon had her upright again and pointing in the right direction. The next big obstacle in our way was the rock slope/wall mentioned on Eddie's website. By now we had kind of split into two groups with the smaller bikes way out in front and the big boys bringing up the rear. As I approached the slope I heard a bit of noise up ahead and stopped the bike. Walking up around the corner I came across a GS on it's side and the rider rolling down the hill to meet me. Luckily there was no damage to rider or bike and we soon had the bike upright and rolled back down the hill. This was hot work I tell you. We also soon had a bike park at the bottom of the slope. We all walked up the slope and started checking out lines and kicking the odd big rock out of the way and generally waiting to see who would be the bravest and tackle it first. We all strung out across and up the slope to be ready to assist each other and I think one of the first to try the hill was one of the Africa Twins. This bike powered up no problems making all sorts of impressive noises and bouncing this way and that as it hit some of the larger rock outcrops. The Twin was followed by a few other bikes including the GS which also nailed it second time so I wandered back to the DL, took a deep breath and fired her up. To approach the wall you first had to come around a sharpish left hander (with plenty of gravel on it), straighten the bike up and then nail it - buttoning off would be the end of your climb. Well, that was how I did it anyway. When I straightened the bike up for the climb I gave the old girl a real handful and she leaped at the wall. I just hung on for the ride and tried to keep the bike pointing in the right direction. According to a few of the guys the bike even launched itself into the air over one particularly large outcrop of rock. In the end I got up the steep bit fairly easily but then had a few issues trying to slow the bike down and park it out of the way - I nearly dropped it again but managed to muscle it back upright and get the stand down on some reasonably level ground. Now it was time to breath again and to have a wee rest while waiting for the last couple of bikes - everyone else made it up without any major issues. Heart-rate back down to below 300 it was time to move off again and try to catch up with the others. Pretty soon we came to the second creek crossing. This one was a lot easier but there was another rocky slope upon exiting it. Unfortunately Colin had had a wee moment on the slope so I had to stop in the creek and climb up to help him get going. We got him up the slope and then he came down to help me launch up the slope from my parking spot in the creek. I can't really remember what went wrong but on my climb up this much less serious slope I must have bounced off a rock or something and ended up dropping the bike again - this time on it's left hand side. It wasn't a major but I broke the tip off the clutch lever (still plenty of lever left luckily) and bent the gear lever slightly. From this point on (as promised) the track got a lot better, being a bit wider, fairly flat and not as rocky. I think I even found 3rd again. We had one last little pause at the top before saying goodbyes and riders took off in their own little groups for the ride home. I hung around a bit to wait while Steve got his gear sorted and had great fun chasing down the others once the road got better (really nice, fast gravel again) and ended up following most back into National Park again. In National Park I refuelled and Colin F and I put on a few more layers for the quiet and uneventful ride home via Waiouru, Taihape and Vinegar Hill.